Create a quizz, send it to your customers, collect the replies. 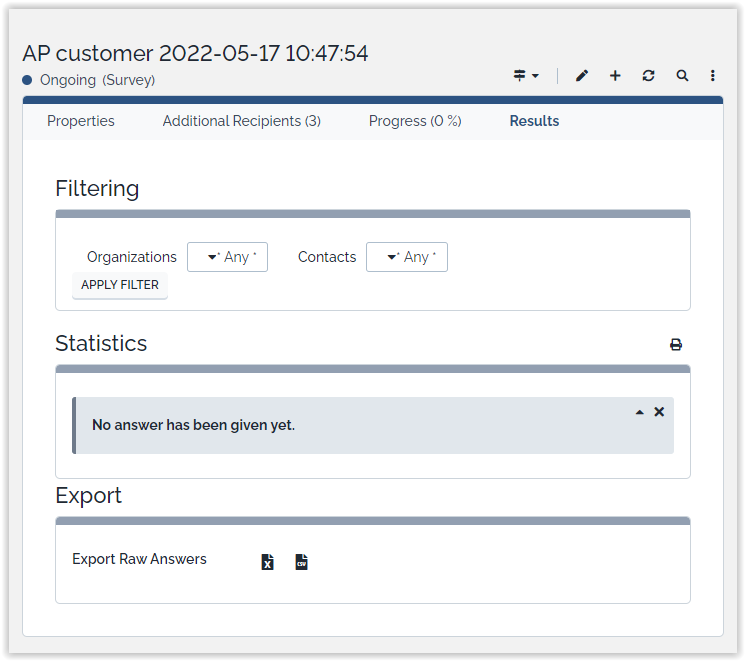 Integrates with the iTop CMDB so that you can send a statisfaction survey to the customers documented in iTop. The quizz can be split on several pages. It has an introduction and a footer message. A quizz will be used in one or more survey campaigns. 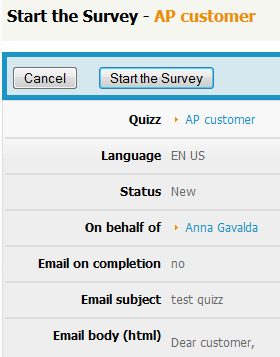 The survey defines to whom the quizz will be sent (scope given as an OQL query). Customers will receive an email with an URL to reply to the quizz. The results can be viewed and exported to an Excel file. By default, the module keeps track of the link between the reply and the contact. As this is prohibited in some countries, depending on local regulations, the module has a anonymous mode. 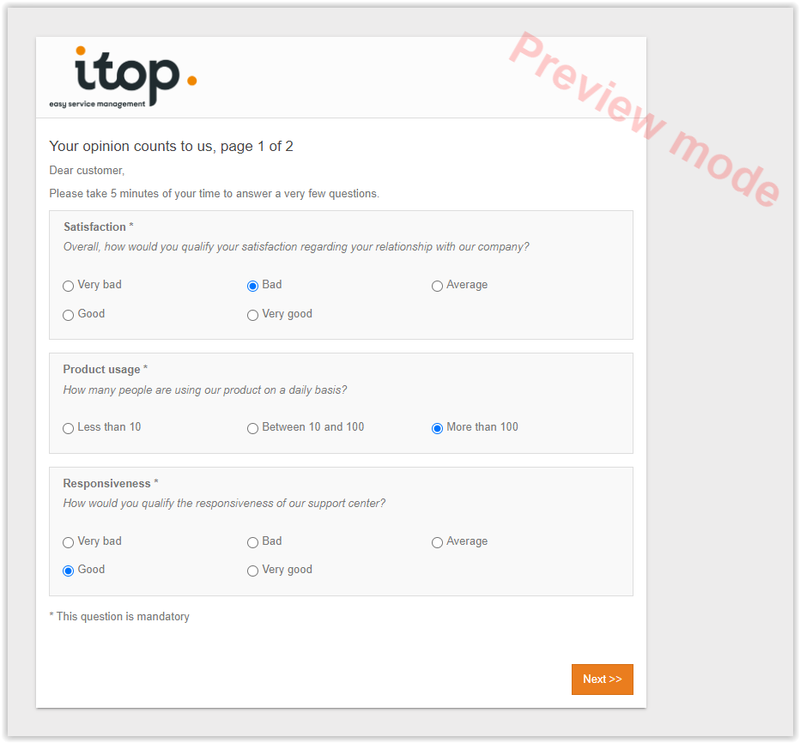 A quizz and its questions can be modified even when surveys are running on it. The effects are unpredictible. Similarly, editing a survey when it is running has unpredictible effects (except adding recipients). Copy the contents of the zip file into the extensions/customer-survey folder of iTop and launch the setup again. When prompted to select the extensions to install, check “Customer Survey” in the list of available extensions. A quizz is a series of questions in a given language. A survey defines the targetted people. It is also the way to follow-up on the progress and get a report on the replies. The first step is to create a Quizz, i.e. a series of questions. Conclusion Message Displayed after the quizz has been completed and submitted. This is the place to say thank you! In the tab “Questions”, enter your questions and page breaks. To modify a question, save the Quizz first, then from the “Questions” tab, click on the link to display the details of the desired question. 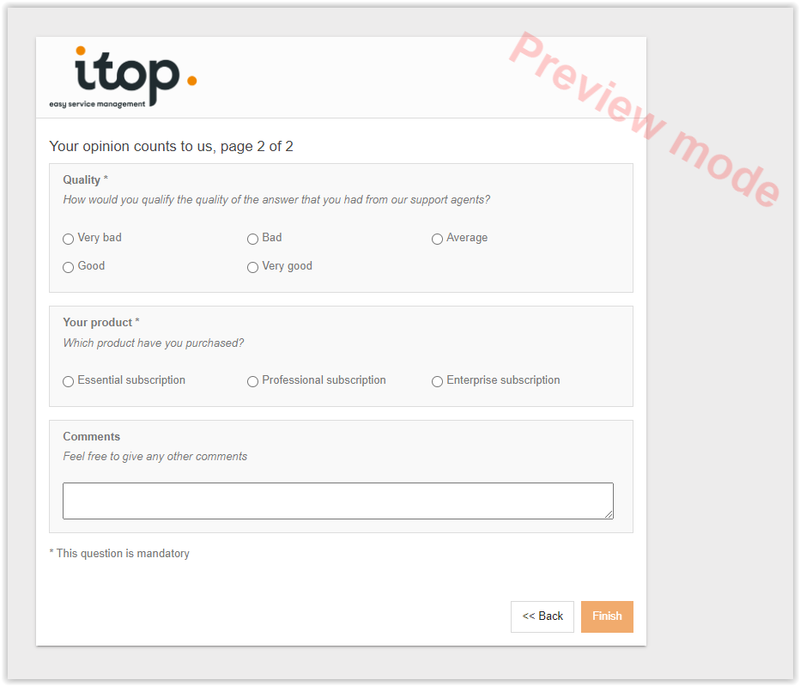 You can then click on the “Modify” button to alter the question, as you would do for any element in iTop. We recommend to use non-consecutive ordering numbers (e.g. 100, 200, 300) in order to easily insert a new question without having to renumber (i.e. modify) all the questions. Free text This is the place for a user comment. Predefined choices The user is asked to select an item out of a list defined for the whole quizz, in the property Default Quizz Choices. This is the way to have a standard defined at the quizz level or at the application level. Specific choices The user is asked to select an item ouf of a list defined solely for this question. Page break Though this is not a real question, a page break is inserted into the stream of questions. The title and description of the page break replace respectively the quizz title and introduction, for the page that comes AFTER the break. Quizz Select the quizz amongst the already created quizzes. Note: the language is displayed right above: it will be updated after the quizz is saved. On behalf of The sender of the survey. The email will be sent with from set to this person. The list proposes any person documented in iTop. Email subject The email title. Email body The email body, in HTML. 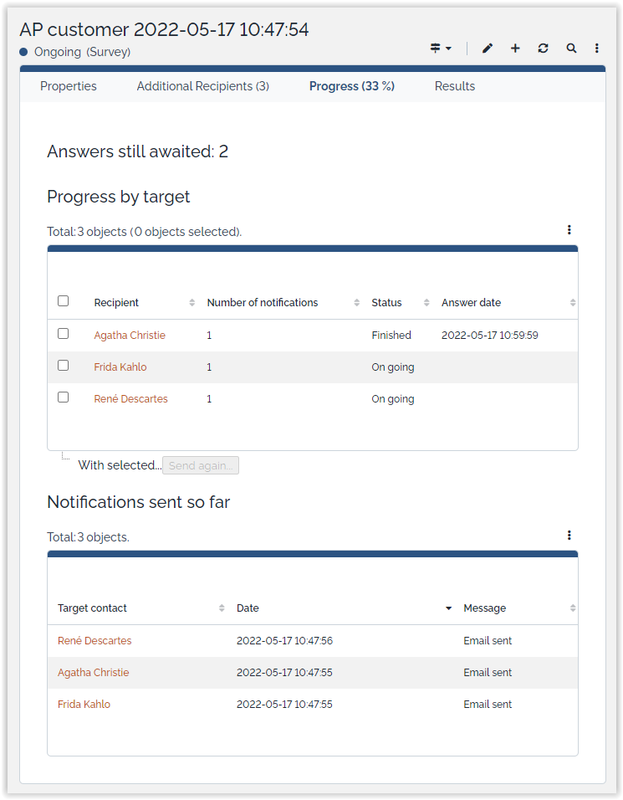 It is possible to complete the list of target contacts defined by the OQL: go into the Additional contacts tab, and add them one by one. 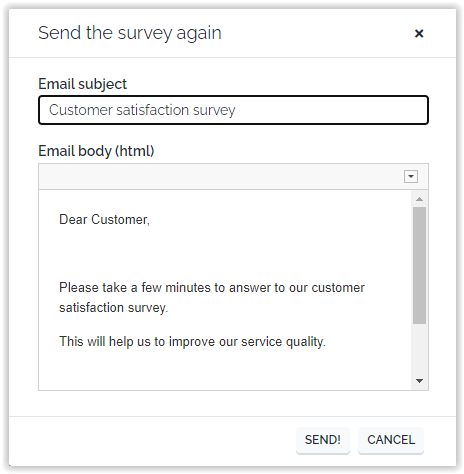 Creating the survey does not send the message. You still have the possibility to adjust the settings, review the quizz. In the Other Actions menu, click on Send me a sample message. It reminds you the settings of the survey. Confirm by clicking the Send me a sample message button. You will receive a sample email, and see what your customers should receive. In particular, this is the opportunity to check language consistency. In the Other Actions menu, click on Start the survey. Confirm by clicking the Start the survey button. All target contacts will receive an email with a link to the quizz form. 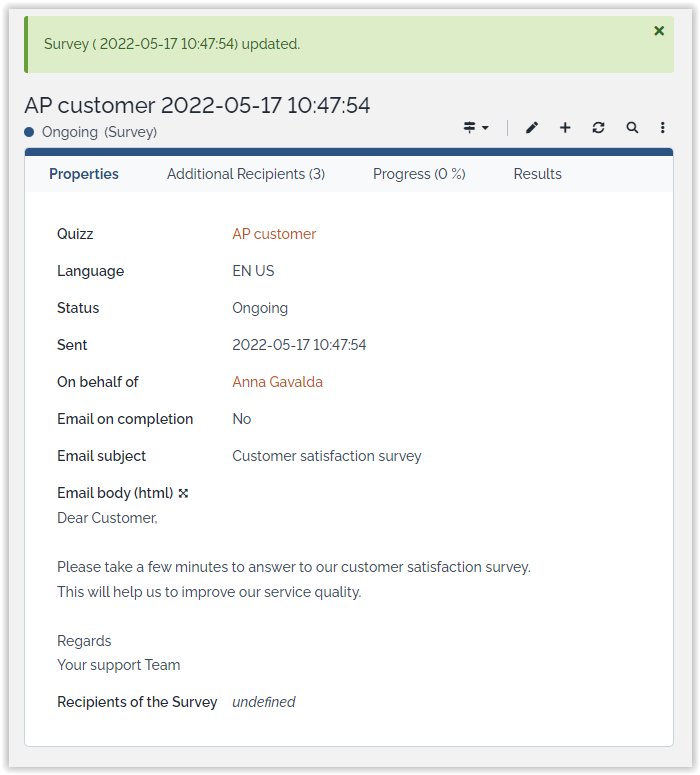 When the survey is running, it is still possible to add recipients: edit the survey and add contacts into the Additional Recipients tab. The newcomers will be notified as you save the changes on the survey. 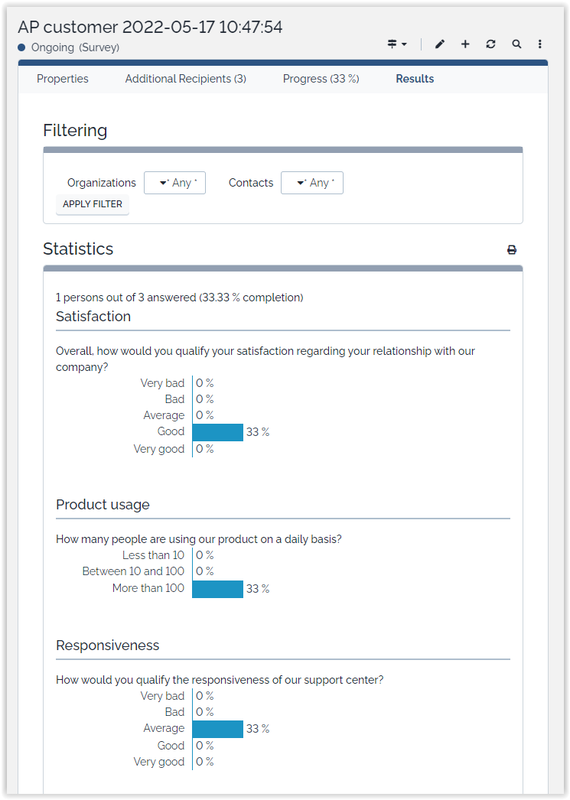 A survey is not closed automatically: when 100% of the users have given their answer, it is still possible to add new contacts and wait for their replies. Replying does not require to login to iTop. The customer has the capability to suspend the quizz at any time by clicking on the suspend button. Resuming can be done either by using the URL provided in the above popup, or by using again the URL provided in the received email. Email subject and body are prepopulated with the orginal values. Adjust them and confirm by clicking on the button Send!. You can use the links Export Raw Answers “For Excel” and “As CSV” at the bottom of the page to export the results of the survey, or the link at the top-right “Printable version” to obtain a printable version of the results page.